For so many of us summertime is filled with activities like traveling, visiting water parks, going for picnics, taking hikes, camping, or just hanging around the house with family and friends. 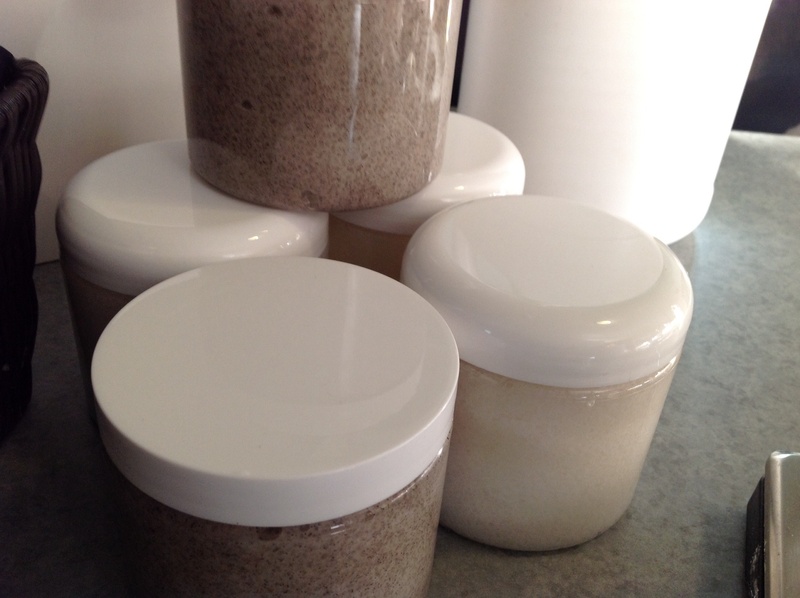 Since I had a group of kids hanging out at my house last weekend, I decided to herd them together for an afternoon adventure so we could create our own salt or sugar scrubs. My kids and I really enjoy the kits that you can get from the catalog and the Glycerin Scrub Base kit is one of our favorites. Why? We love this kit because all we absolutely have to provide is the salt and sugar. We can add extras if we want to do so, but we don’t have to! The Glycerin Scrub Kit comes with a full gallon of Glycerin Scrub Base, Oval Spoon, 20 jars and lids, fragrance and labels. This means that everyone gets their own jar! No sharing is required. After the kids straggled into the kitchen, we gathered up enough containers for mixing for everyone to have a mixing bucket for their own scrub. 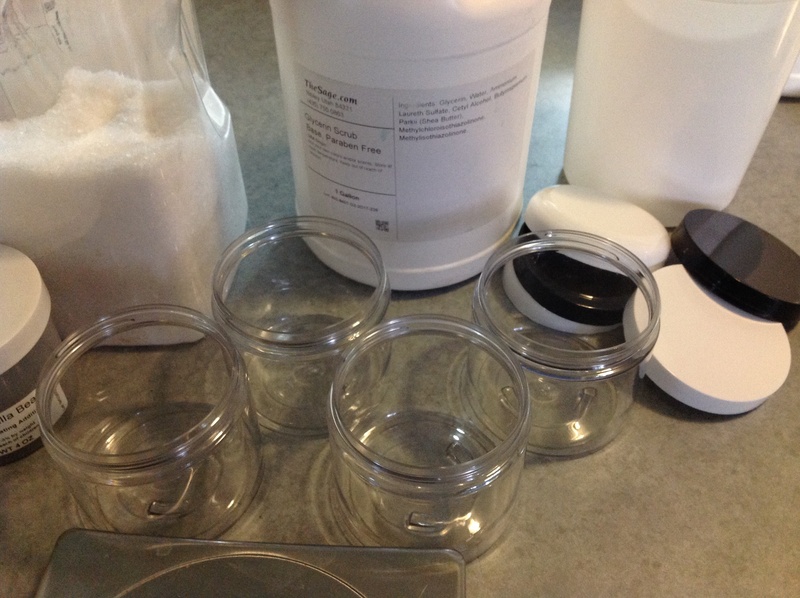 Each person measured out approximately 9 oz of the scrub base and 9 oz of salt or sugar. 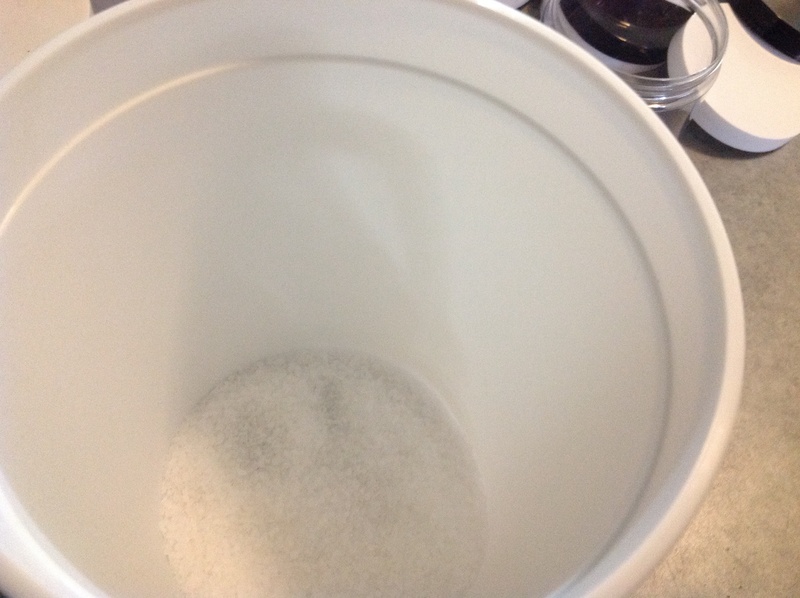 While the kids were weighing their salt or sugar, I shook the gallon jug of scrub base to ensure it was completely mixed as this base does tend to separate in the jug. Then after the base was thoroughly mixed, we weighed the base and added it to the buckets. As the kids stirred, we added the fragrance of their choice as well some Ground Vanilla Bean Specks. If you think the scrub isn’t thick enough, add some more salt or sugar. Just remember that your scrub will become a little thicker after sitting overnight. Once mixed together, spoon or scoop directly into the 16 fl oz jars. This mixture of 18 oz by weight filled one 16 oz Deep Jar! 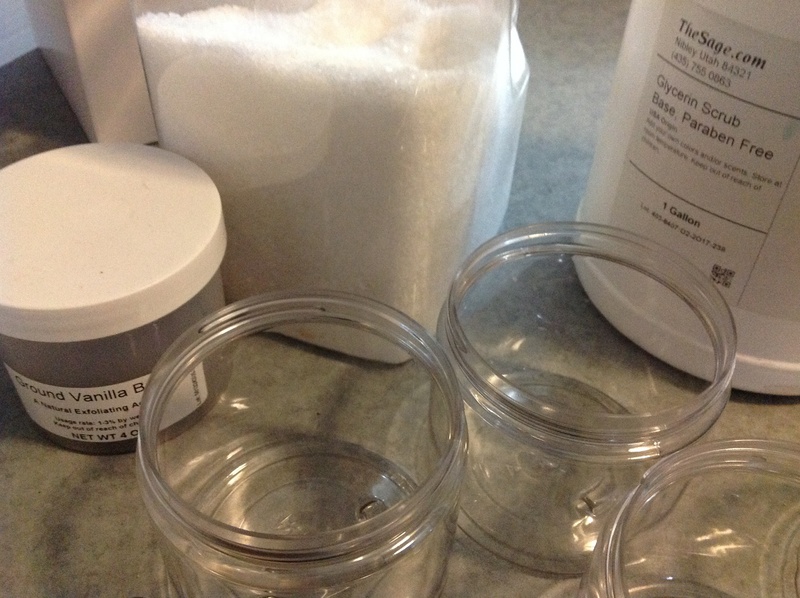 After cleaning any spills, simply put the lid on the jar and apply the label to the lid. How simple and easy is that? Now you have a stash of scrubs and a fun way to encourage teens to actually use soap in their next shower. Looking for a bit of color to add to your scrubs? I suggest ordering the Water Soluble Colorant Kit. This kit contains the 3 primary colors that we use for blending, and a package of dropper bottles. A fun way to add some color to your scrubs.